Click the image above to view our infographic on uninsured motorists. New York is a ruthless place for drivers. With bumper-to-bumper traffic, gridlocked streets and constant construction, driving has become more of a burden than a benefit. Because of these factors, New York is regarded as one of the most accident-prone states, which is bad news for the average 1 in 7 drivers who do not have insurance. Shockingly, an estimated 13.8% of motorists are uninsured, despite their annual $10.8 billion owed in damages to insured drivers. Let’s look at some facts here to serve as a cautionary warning for incautious drivers. $860.5 million is the total revenue collected from tickets issued to motorists who are uninsured, and nearly 40% of vehicles are fifteen years older and without insurance. The number of uninsured drivers rises during economic downturns, as more people find it necessary to let their policy lapse. This is despite 49 state laws that require basic liability insurance for motorists. *This figure is concurrent with the total percent of motorists who are uninsured, showing no statistical evidence that uninsured motorists are less capable drivers. The rates of uninsured motorists widely vary, from 4% in Massachusetts to 28% in Mississippi. 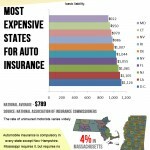 Automobile insurance is compulsory in every state except New Hampshire, and Mississippi is the state with the highest percentage of uninsured motorists, with a 26% rate of uninsured drivers. Alabama and California tie at 25%, with New Mexico close behind at 24%. Arizona ranks in at 22% and finally, the insurance-less drivers of Tennessee are right behind at 21%. In stark contrast, Maine has the lowest percentage of uninsured motorists, with only 4% of uninsured drivers. Both Vermont and Massachusetts have a 6% uninsured rate, and 7% of New Yorkers similarly lack coverage. Lastly, Nebraska and North Carolina maintain an equal 8% of uninsured motorists. According to a recent study, 24% of uninsured motorists blame their vehicle for lack of coverage, citing inoperable conditions. Furthermore, 21% claim they cannot afford insurance, with 20% of people convinced that premiums are too high. Finally, 17% of drivers rationalize that while their vehicles run, they are used minimally and do not require insurance. >> In 48 states and Washington D.C., there are severe penalties for driving without insurance. In addition to losing your driver’s license and/or your car’s registration, you will likely be required to pay a hefty fine. Fines vary by state, ranging from a hundred dollars to several thousand. You may also be mandated to have your license or registration reinstated. For those New Yorkers who can relate to the infographic stats listed below, consider using New York Motor Insurance to compare the best car insurance quotes and rates. Whether you’re a teenager, student, high-risk driver or a professional with a clean driving record, New York Motor Insurance can ensure coverage when life’s mishaps become another part of the commute.